Margaret gave it five stars. David refused to give it any. 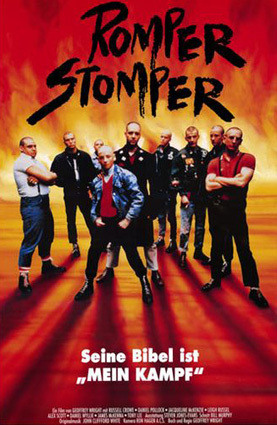 In fact, The Movie Show’s co- host even suggested that the negative of Romper Stomper be burned, according to the cosy commentary on the DVD of this decidedly uncomfortable film. Writer/ director Geoffrey Wright talks us through his skinhead saga with producer Daniel Scharf, editor Bill Murphy, composer John Clifford White and make-up artist Chris Miller providing insights into the controversy that erupted around its 1992 release and giving a convincing artistic defence ten years down the track. Wright sourced his material from a series of newspaper articles about gangs of neo-nazis raising their ugly heads around Melbourne in the late ’80s, which he then passed on to his cast members as research. Man of the moment Russell Crowe stars as Hando, the extremist patriarch of the fictional group, and as he reveals in a separate interview done at the time, he drenched himself in information reading Mein Kampf and Psychology of Mass Murder in the Twentieth Century to get himself into the mindset of “a psycho”. Hando is part of a perverse love triangle, which includes the increasingly sensitive Davey (Daniel Pollack) and the epileptic recruit Gabe (Jacqueline McKenzie). As they and the rest of the gang proceed to bash their Vietnamese rivals to a pulp in the steely blue alley ways of Footscray our commentators draw our attention to the snazzy Super 16mm camerawork by Ron Hagen and Crowe’s instructions to his men to “Fall back, fall back!”, lines that Wright thinks later made their way into Gladiator. Watching this confronting film in such an intimate manner certainly takes the edge off its inherent violence. Miller tells how, under the duress of the daily shearing schedule, her electric clippers imploded half way through the shoot and Scharf reveals that he had to bail the entire cast out of jail the weekend before filming began, so thorough were they in their efforts to break in their characters’ Doc Martins. So if you were hesitant about seeing the film in all its gory intensity when it first came out, perhaps the DVD audio commentary will give you a way in to this important Aussie flick and help you to witness the performance that focused Crowe in the viewfinders of international directors.